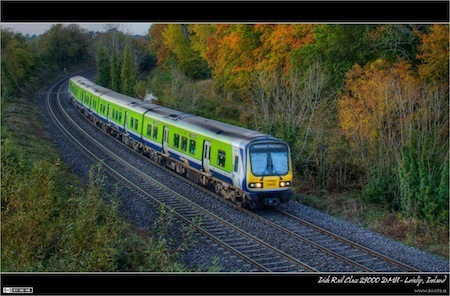 One of my favourite places for photographing trains is Jackson’s Bridge, it’s one bridge west of Maynooth along the Dublin to Sligo mainline towards Killcock. 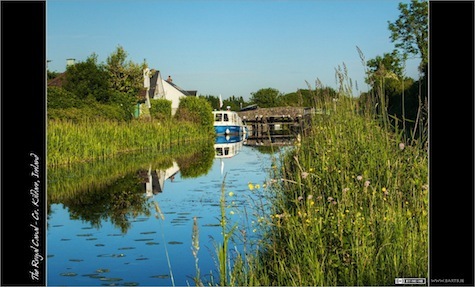 Jackson’s bridge actually crosses both the Royal Canal and the railway line, since the two run parallel most of the way between Dublin and Mullingar. 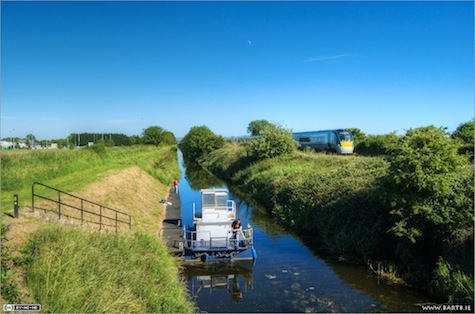 When you look East from Jackson’s Bridge towards Maynooth and Dublin you get a great view of the the track, the canal, the towpath, and a row of trees all running parallel next to each other almost as far as the eye can see. This is normally a very quiet stretch of line with very little traffic on it, but twice a day the level of traffic really picks up. 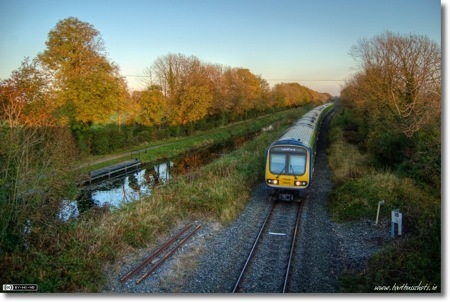 During the day most commuter trains terminate in Maynooth, but during the morning and evening rush some commuter trains now run all the way out to Longford. The number of InterCity services also increases at rush hour so you get a few trains an hour instead of a train every few hours! I took this shot in mid-October when the trees have their nice autumnal colours, and when the evening rush-hour over-laps with the Golden Hour. I really like how the soft golden evening light interacts with the subtle autumnal tones of the trees. 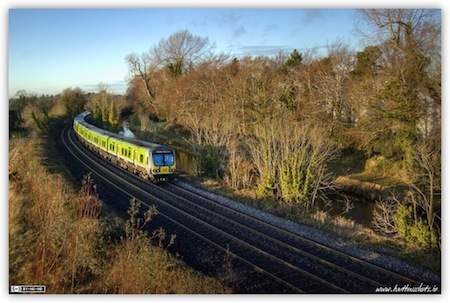 Here we see an evening commuter train, consisting of two Class 29001 four-carriage diesel railcar sets joined together, making it’s way from Dublin to Longford. The front-most of the two railcar sets is number 29415. I think one of the reasons I like this shot so much is that the composition feels both strong and natural to me. I think the strength comes from the strong diagonal of the railway line, canal, towpath & trees, and I think it feels natural because the vanishing point is at one of the magical “rule of thirds” regions (one third down from the top and one third in from the right). If this week’s instalment reminds you a lot of last week’s, that’s no coincidence, this week’s shot is also of Pike’s Brige, and also shot at the same time of day, the so-called golden hour around sunset. There are some marked differences though, last week’s shot was taken into the sun, this week’s is taken with the sun directly behind the camera – meaning this is the opposite side of the bridge. Although the conditions look identical, the shots were actually taken two days apart. Photography is all about light, and you get some of the nicest light each day in the hours around sunrise and sunset, or the so-called ‘golden hours’. I’m not a fan of early mornings, so, for me, there is only one golden hour each day, but some of my very favourite pictures are taken during that hour, including this one. I got this photo on an evening when I wasn’t really planning to shoot, I was out getting some much-needed exercise, and brought the camera along ‘just in case’. I’m certainly glad I did. The light was superb, and it’s very rare that the water is this still under the bridge. The dynamic range was very large in this shot so I tonemapped the RAW file in Photomatix Pro to recover both the shadows and the highlights. 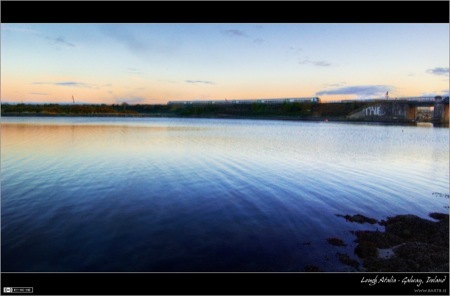 I have also edited this image for use as a desktop wallpaper on either a standard (4:3) or widescreen (16:10) monitor. 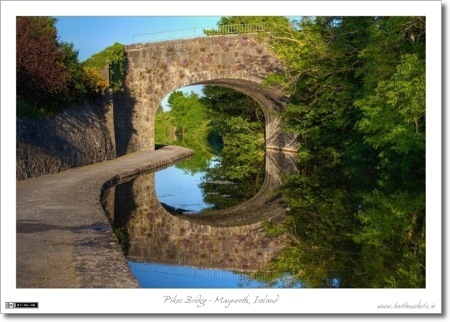 This is Pike Bridge between Maynooth and Leixlip in Co. Kildare, Ireland. 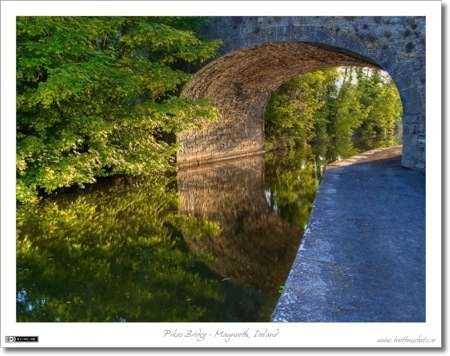 It has two arches, one crossing the Dublin to Sligo railway line, and this one crossing the Royal Canal.